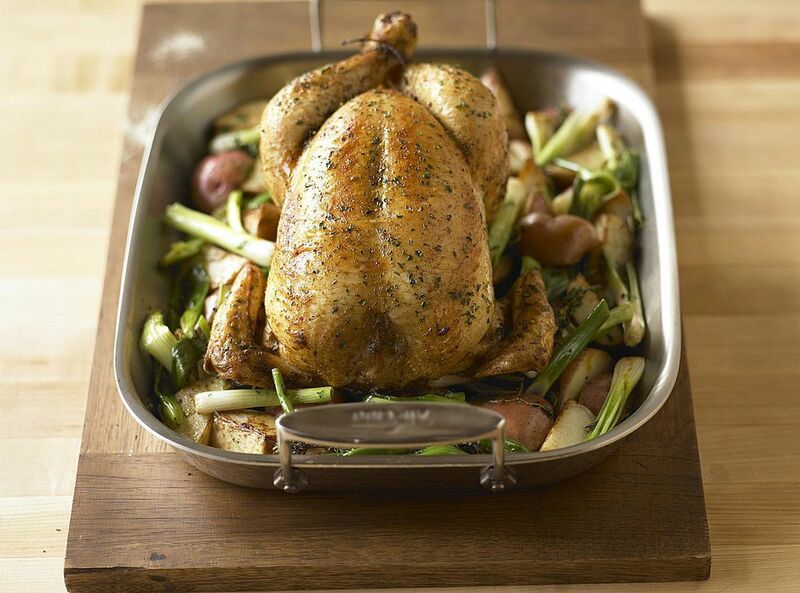 A roast chicken is a quintessential dish in kitchens across the globe. It is a traditional Jewish holiday entree, as well as the perfect meat for a Sunday lunch. It is even considered a simple weeknight meal as most of the cooking is unattended in the oven. A roast chicken is a great alternative to red meat as it is a lighter, and healthier choice since it has a lower total fat content (with most of it monounsaturated). It is also good in the summer months when it's too hot for the traditional roasts and grilling isn't an option. A perfect roast chicken should be cooked carefully to make sure it is done all the way through but is still moist and has a lovely crisp, golden brown skin. But don't be intimidated by this—cooking a whole chicken is very easy, especially when you follow these handy tips. You will notice in the poultry section of your grocery store there are a few choices when it comes to whole chicken. For the most part, you can't go wrong with what you choose—a fryer vs. a roaster, free-range vs. regular—as long as you follow some simple steps when prepping and cooking. If you can, however, buy a chicken which is free range—although more expensive, corn-fed and organic are the best for flavor and texture. When it comes to size, a 3 1/2 pound chicken will feed four well and still leave you with leftovers. This size bird is usually labeled as a "roasting chicken" or "roaster." Most recipes will call for using a roasting pan that is large enough to hold the bird, but where they differ is whether they recommend a roasting rack or not. The choice is up to you. The rack lifts up the chicken, allowing for the bottom skin to crisp. It also creates space for vegetables and potatoes if desired. If you don't have a rack, you can place the chicken either directly in the pan (although be prepared for the skin to stick to the bottom), or on top of vegetables and potatoes which will not only act as a rack but will also add a bit of flavor to the bird. If the chicken needs to be stored before cooking, leave it in its packaging and place in a deep roasting tray in the fridge on a lower shelf to make sure that any juices from the chicken do not leak onto any other foods creating cross-contamination. About two hours (or more, if possible) before you plan to put the chicken in the oven, unwrap the chicken, remove any giblets from inside the cavity, and give it a quick rinse inside and out. Make sure to pat dry very well with paper towel. Return the chicken to the roasting pan and place—uncovered—in the refrigerator. This will help the skin dry and make for a more crispy exterior. At the time of cooking, the chicken should be at room temperature—not cold straight from the fridge—so remove from the fridge an hour before and leave on the counter (but make sure it's not a warm place). No matter what, you should always put the chicken into a preheated oven and cook to the correct internal temperature. But you can roast a chicken at almost any oven temperature. If you want a crispy skin (and a shorter cooking time), then set the oven between 375 and 500 F; if the fall-off-the-bone meat is what you're after, then a low-and-slow cooking method is your friend (300 to 350F). The most common technique is the higher temp/quicker time, where the chicken should be roasted for 20 minutes per pound plus an extra 10 to 20 minutes to ensure it is cooked through. It is best to use a meat thermometer—pierce it into the thickest part of the breast and look for a temperature of 165F. If you don't have a thermometer, then pierce a knife between the leg and the body of the chicken—the juices will run clear when the chicken is cooked properly. Whether you desire the most simple roast chicken or something with a bit more zest, seasoning the chicken with salt before cooking is a must—both inside the cavity and on the skin. Chicken is one of those meats that takes on many other flavors, such as herbs, garlic, and onion, which can be stuffed into the cavity. Lemon is also a particularly good flavor with chicken—squeeze a bit of the juice over the skin, add the zest to softened butter to rub under the skin, and place lemon halves inside the cavity. Before cooking the chicken, rub the breast and legs thickly with softened butter and then sprinkle with a little sea salt. The butter and salt will help create a crisp, golden skin and taste divine. If you'd rather not use butter, you can coat the bird with olive oil, but you won't get as crispy a skin. An important part of cooking any meat is once it is removed from the oven the meat must rest. Once the chicken is cooked, remove from the roasting pan and place onto a serving plate; cover loosely with foil and leave for a minimum of 15 minutes before carving. Making a Traditional Hand-Raised Pork Pie is Easier Than You Think.